We were not as excited to do a run simply because my last run was more than a year ago, and John haven’t even ran for once. But this turned out to be a big reason why we should. 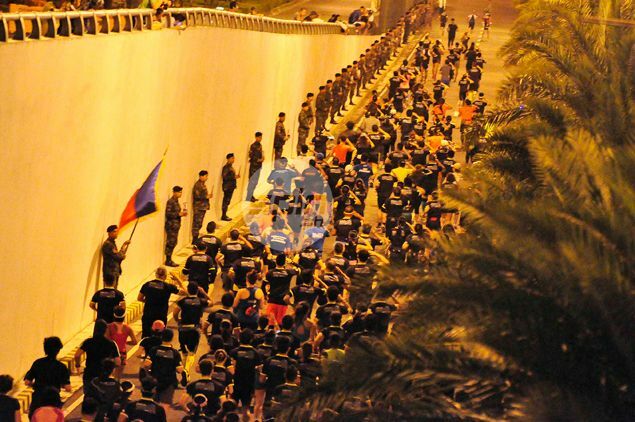 The annual Condura Skyway Marathon is definitely one of the much-awaited race of the year. Last year, the Run for the Mangroves was cancelled due the to emergency situation of Yolanda typhoon. The organizers chose to use their budgets and efforts for helping the victims. This year, Condura honors Hero Foundation. Since 1988, Hero Foundation has been sending children of fallen soldiers to school. 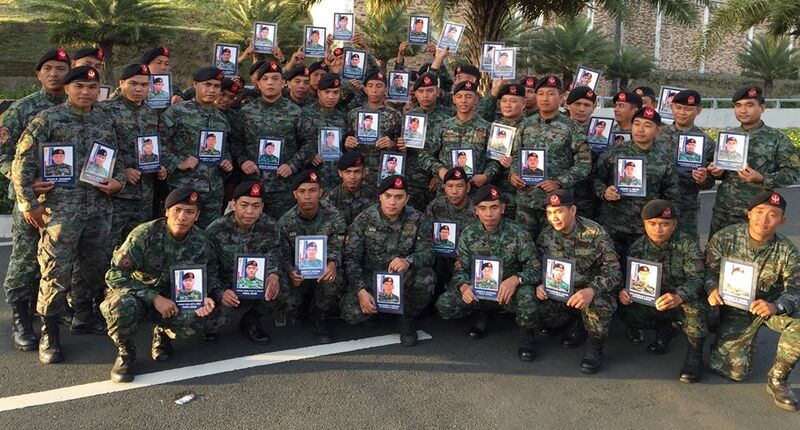 Now, the event went more significant due to the 44 SAF soldiers who have fallen on Mamasapano. But why do people choose to attend this event every year? 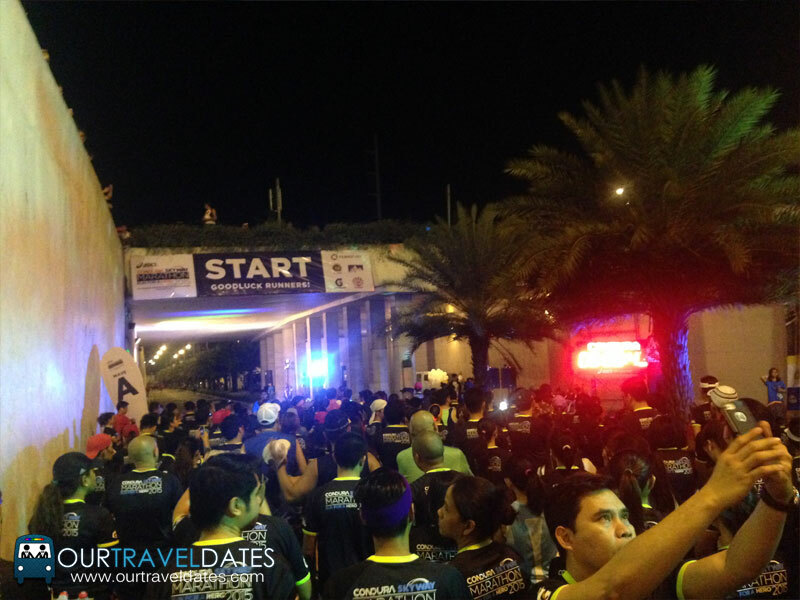 You get to actually walk and run on the Skyway itself, something that you can only do when you’re in this event! The feeling of running on a straight race track and the amplified wind because of the elevation makes it super comfortable to run. The memorabilia for being a finisher is superb. Finisher’s medal in a typical event is only attainable when you run half or full marathon only. But with Skyway Marathon, even the 6K and 10K finishers get to receive a finisher’s medal! We were super paranoid because we barely had preparations, and we were just messing around the treadmill and elliptical machines 2 days before the run, that we didn’t even last for 30 minutes on a very low intensity. So we had to arrange a memorial plan! 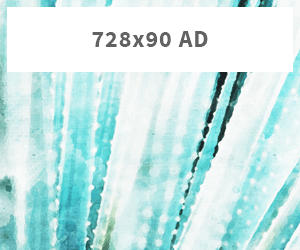 If you think we’re just kidding, look at the date! Haha! Also, we almost attended a birthday celebration that is composed of a huge pool of drinks 8 hours prior to this event, but luckily we were able to skip it unintentionally. At least we had around 5 hours of sleep. 5 hours. So much for getting ready for our first run of the year, first run together. Tawa na lang! We woke up at exactly 3AM, 2 hours before the 10KM gun start. We weren’t even trying to hurry up. Just eating a bunch of Lacatan bananas while prepping up. 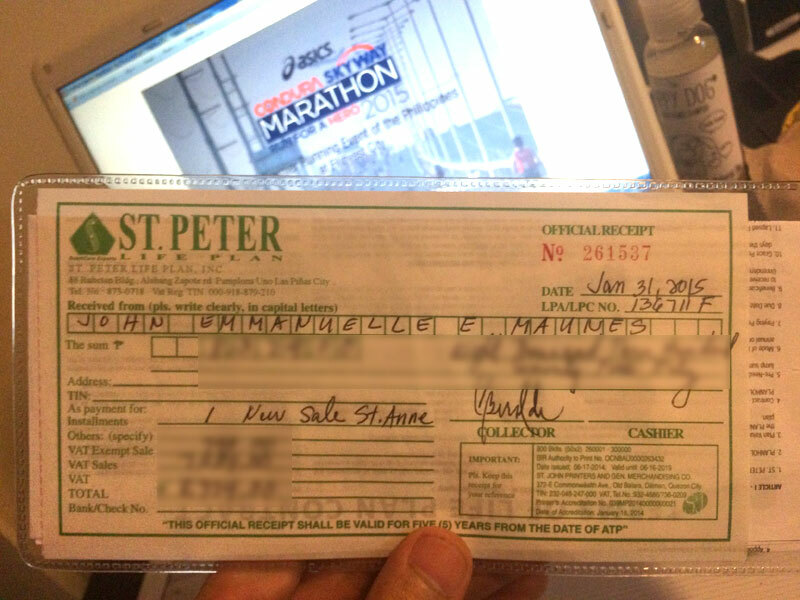 We were lucky to arrive at the runner’s village as early as 4AM thanks to the taxi driver who had to ask for an additional P100 because walang pasahero pabalik. K.
We were on Wave C. Each wave starts in an interval estimate of 4-5 minutes per wave. After all the stretching, firework-watching, and repeatedly singing to this run’s LSS theme, “Heroes” by Alesso, it’s time to run! Those are the PNP Special Action Force standing at attention along the tunnel leading to the Skyway ramp and holding the photos with names of the Fallen 44. 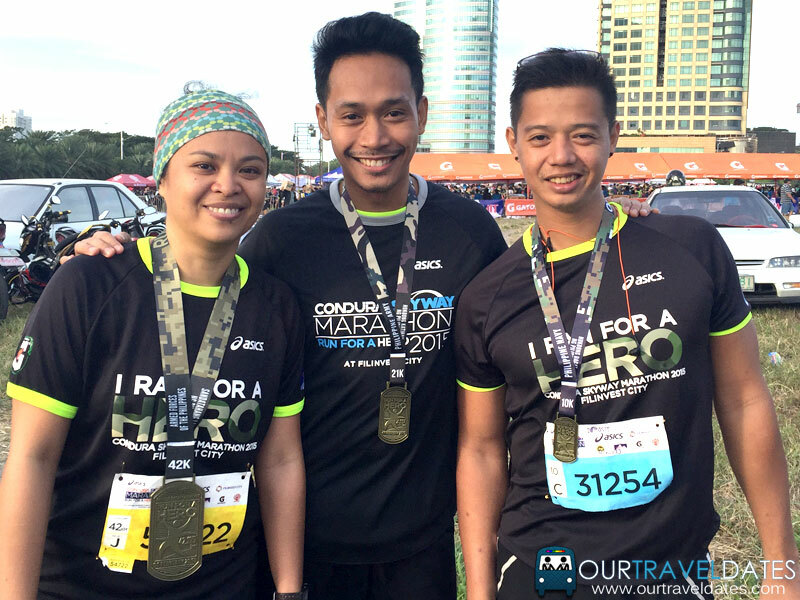 After passing through, it made us realize that this run should be a no-match against the sacrifices these heroes made for our country. It was the perfect starting push for this 10-kilometer journey. This was our first time to run together, and we were both pacing each other, so we were just about to make a benchmark to beat on our 10K run. During the first half of the run, we have both managed to run continuously. Until the 5th kilometer mark. I wanted to pull away from John’s pace because my feet started hurting and my legs are starting to feel the pain. He stayed with me (Yiii!). The walk-run-walk-run episode started. Thanks to the 10K route, the 2nd half is mostly downhill so there’s a minimal need for acceleration that you can even jog in place and still move forward. In the end, we were both smiling on the last 250 meters and just dashing forward all the way to the finish line, knowing that we both did the unimaginable. Even without much practice, we survived 10K with an estimated time of 1:24:00! It definitely isn’t a good run to think compared to the standard 10K runners, but yeah, we still finished. That’s all that matters for now! As expected, the runner’s village becomes the big concert area after the run. We got our share of the replenishments. Overall, it was a fun and inspiring experience. 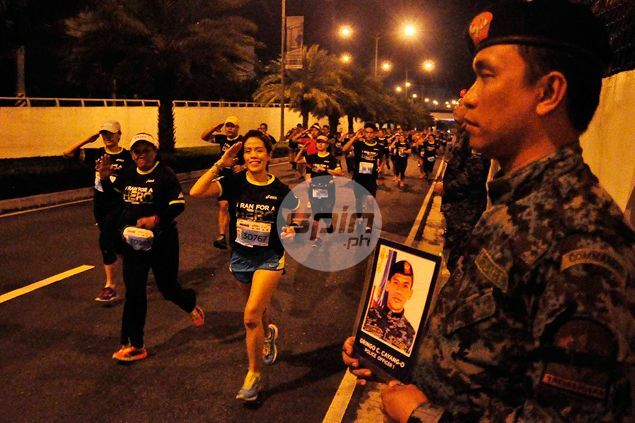 The pleasure is definitely ours for running in honor of our fallen heroes especially the #SAF44. 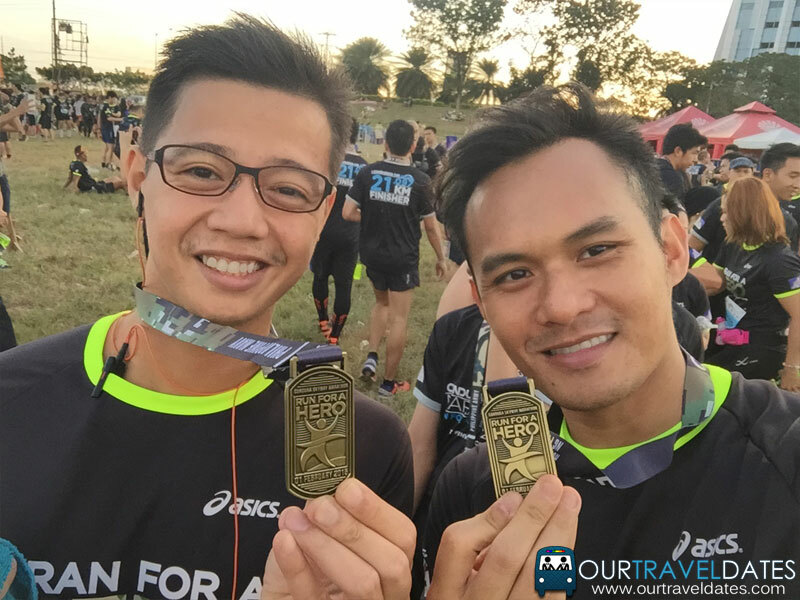 Let me take this opportunity to congratulate my partner for surviving his first 10K run, first running event, and his first medal too! Yey! Let’s make sure we run 21K next year okay? John’s first finisher’s medal! Yay! Cheers to more. Plus, we were able to take a photo with some of the guys from the Philippine Navy too! We missed the PNP-SAF troops. Congratulations to all finishers! See you again next year! So yes, it's finally happening again! ETC's Paintensity Sinulog 2017 is back for another exciting paint and color mix party. Come to The Greenery on the 14th of January starting at 4:00PM all the way until the dawn of January 15th! See you there! LIFEDANCE 2015: Join Sinulog Cebu’s Premiere EDM Party!